Spring may have got off to a slightly snowy start but it hasn't stopped The Botanist embracing the changing of the seasons with a brand new menu, perfect for those lovely lighter days and longer evenings. 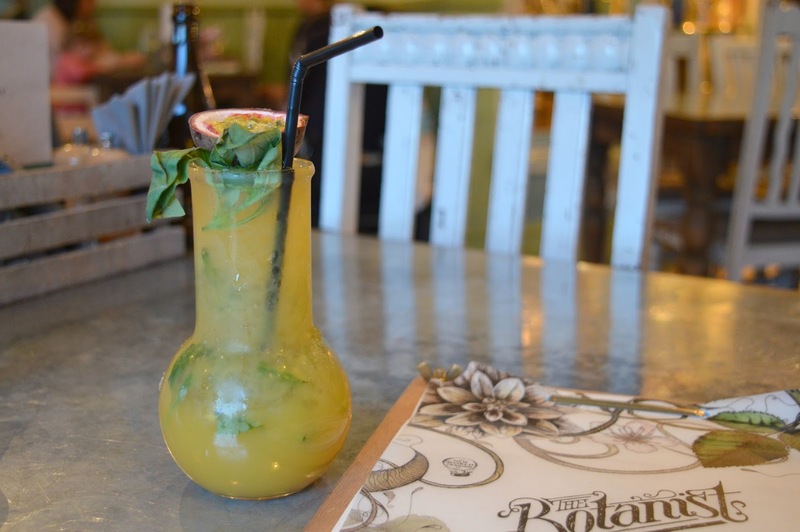 I love Spring and the opportunity it brings to crawl out from under my duvet and start filling my diary with date nights and catch up with friends, and what better place to indulge than at The Botanist? Starting with a night out with my husband. 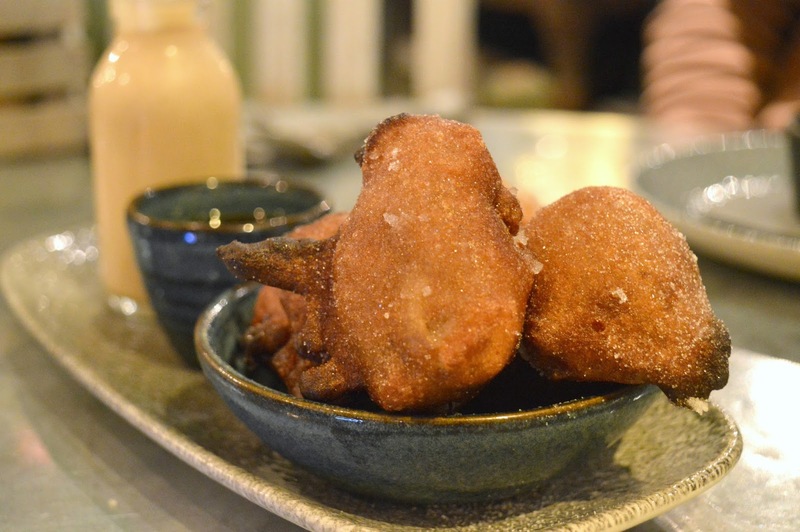 There are some obvious changes to the Botanist's food menu including additions to the Deli Boards and Activated Charcoal Flatbreads but there are also some changes that are, perhaps, not very obvious. Most of the dishes on the menu have had a slight refresh for Spring, making the favourites even tastier than before. Before we carry on, let me just pass on a bit of life advice for you. If you're planning on heading to The Botanist to try out the new Spring menu for yourself, please make sure you go with a friend who loves cheese as much as you do. There is an AMAZING new addition to the menu - a whole camembert baked in garlic and rosemary sourdough with braeburn apple and smoky apple ketchup, and I stupidly went with someone who doesn't like camembert! I do sometimes find myself questionning my life choices - how on earth could I marry someone who doesn't like camembert? Cheese related sulks over, I opted for Creamy Garlic Mushrooms (£5.50) as my Starter and was very amused when it turned up in a a "perfect for Spring" flower pot. Peering into the pot it honestly did look like I had been given a pile of soil but once I'd dug my spoon in I was delighted to discover a never ending well of delicious creamy mushroom and garlic. It went on and on and on and once it had all gone I got to mop out the last remaining parts with a mini Hovis loaf ... I was in heaven! 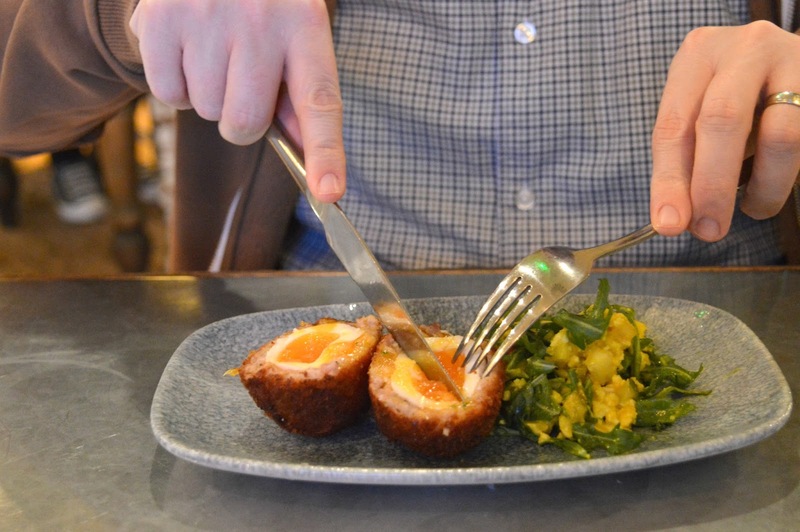 Simon opted for the Cumberland Scotch Egg with homemade piccalilli (£5.95) which he declared to be the best he'd ever tried in Newcastle. 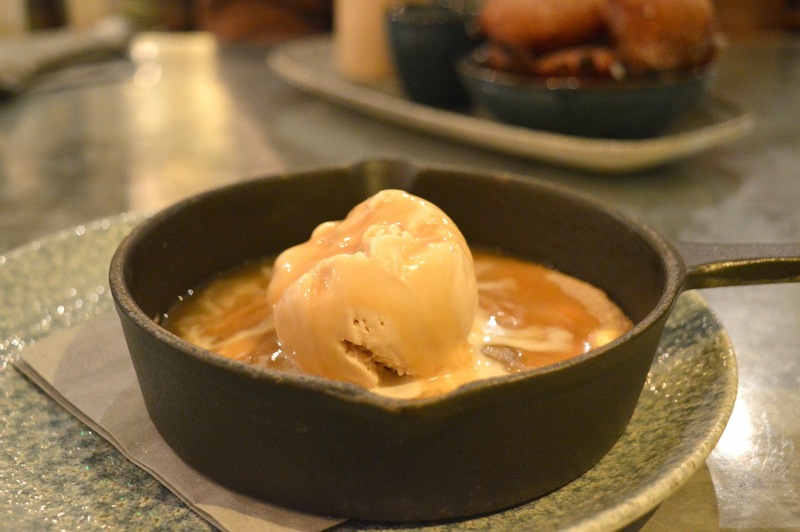 It was only a few weeks ago that he'd announced that their Sticky Toffee Pudding is the best so it seems that when Simon is dishing out awards The Botanist takes their fair share! 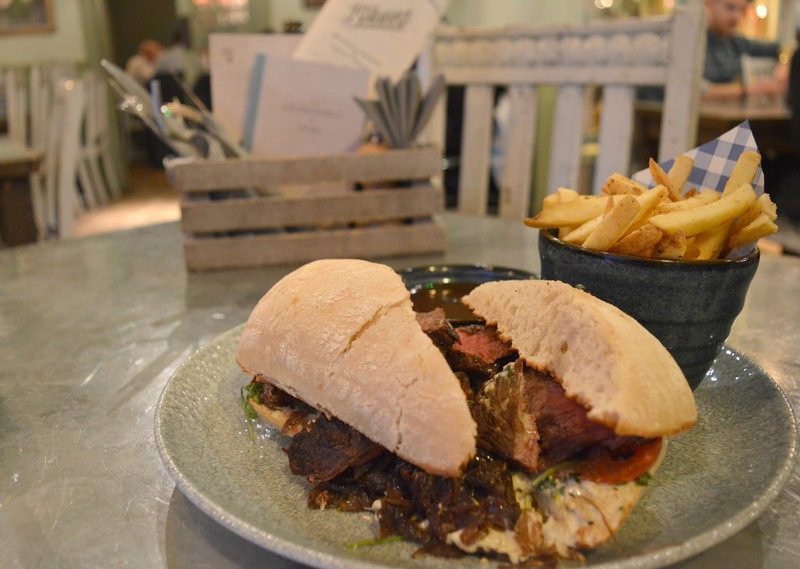 One of the new additions to the menu that really caught my eye was the Flat Iron Steak Sandwich (£11.95) served with whipped garlic goat's cheese, fried onions, seasoned chips and rotisserie gravy. It was mammoth! So huge that I couldn't actually finish it. The steak was the perfect shade of pink and I loved the delicious flavour combination of tender beef with goat's cheese. I wish that it was perhaps served on a slightly softer bread as it was very hard to try and cram this giant sandwich into my mouth and in the end I had to leave most of the bread as it was just too much for me. 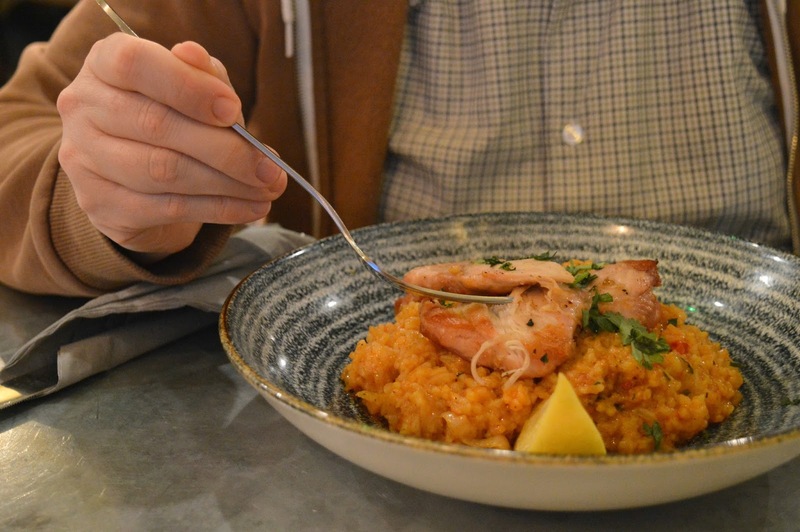 Simon chose the Paella with Chicken Thights, King Prawn and Chorizo (£12.50). I was surprised that he hadn't gone for one of the famous Botanist Hanging Kebabs but he said he'd wanted to try something different. It looked delicious but I'll admit I didn't actually try any because I was too busy doing battle with my steak sandwich! There was one addition to the desssert menu that I was desperate to try - the Homemade Banana Doughnuts served with salted caramel sauce and peanut milkshake (£5.75), unfortunately my nut allergy made this one a no go so I had to do the next best thing - convince Simon to order it and then spend an agonising 10 minutes watching him eat it without being able to try any myself. I desperately tried to get him to describe what it tasted like but was mostly met with mmmmm as he stuffed yet another fried banana ball into his mouth. So if one of you could go and try it for me and report back I'd be very grateful! I decided to go for the next best thing - Baked Chocolate Chip Cookie Dough with salted caramel ice cream and toffee sauce (£5.95), now known as the sweetest dessert I have ever had. This one really is for the sweet tooth, it was pretty sickly and after all of the food I'd just had it was a real struggle to eat. This one is definitely only a dessert for the brave! 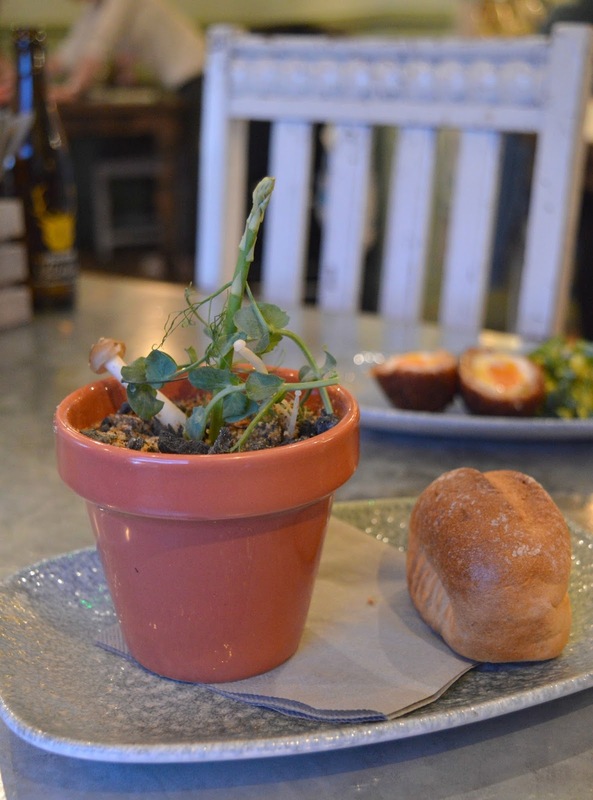 We really enjoyed trying out the new Spring menu at The Botanist and I'm looking forward to a long hot season (fingers crossed!) of endless food and cocktails with my favourite people in my favourite spot in Newcastle. We were invited to enjoy a complimentary meal for two in exchange for this honest review. Eat the camembert .. make me jealous! I sympathise - my other half won't do cheese either! It's so annoying isnt it!!! Maybe I should have just gone for it!